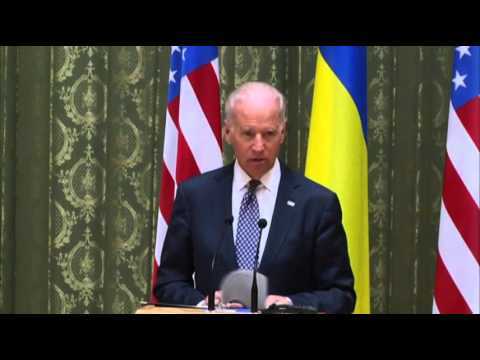 Published: April 22, 2014 12:00 am Updated: April 22, 2014 6:56 a.m.
KIEV, Ukraine — U.S. Vice President Joe Biden warned Russia on Tuesday that "it's time to stop talking and start acting" to reduce tension in Ukraine, offering a show of support for the besieged nation as an international agreement aimed at stemming its ongoing crisis appeared in doubt. The warnings for Russia from both leaders demonstrated the fragility of the multinational agreement reached last week. "I know the men and women who hide behind masks and unmarked uniforms, they do not speak for you," he said. "All are welcome as equals in shaping a new Ukraine. We count on you to be the voice for rights and freedoms." Sen. John McCain, who recently visited the region, described U.S. allies in Eastern Europe as "extremely nervous" about the intentions of Russian President Vladimir Putin. In an MSNBC interview, the Arizona Republican called on Obama to give the Ukrainian government "some weapons to defend themselves." McCain, the ranking Republican on the Senate Armed Services Committee, said America must show more support for countries under siege. That doesn't mean the United States "must fight" every war, he said, but "the only thing that Putin understands is a strong, viable alliance." Biden's visit comes at a critical time, days after a tenuous international agreement was reached to de-escalate violence in eastern Ukraine, where pro-Russia insurgents oppose the government in Kiev. "You face very daunting problems and some might say humiliating threats that are taking place indirectly," Biden told the Ukrainian lawmakers. He said the United States is an example of people from different cultures united as one nation, although he said Ukraine has a big difference. "We're not sitting against a border of another powerful nation," Biden said.